Apple is targeting a ship date of 2019 for their electric car project, according to a new report from The Wall Street Journal. The accelerated launch schedule is apparently the result of Apple committing to the electric car project, which is code-named Project Titan. Apple is prepared to hire a team of 1,800 people to work on the electric vehicle, and the company has made aggressive efforts in hiring experts in electric vehicles and driverless cars. WSJ notes that an autonomous self-driving “capability is part of the product’s long-term plans“, but the first version likely won’t be driving itself around, citing sources familiar with the project. aiming for production in 2020. 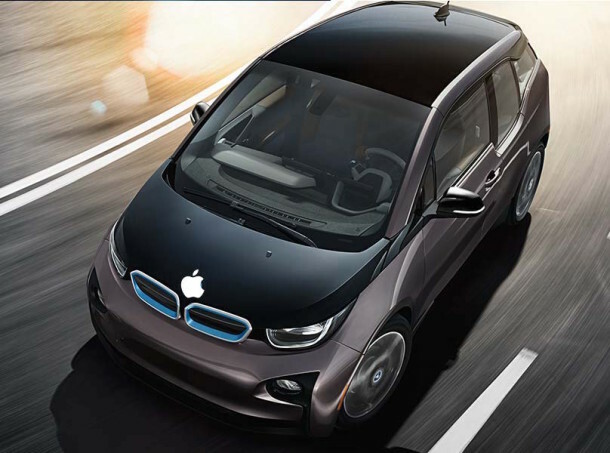 A variety of other rumors have surfaced about the vehicle since, including that Apple was said to be exploring a collaboration with BMW to use the body of the BMW i3 for the project. Another rumor suggested the Apple Car project may actually be a large HUD (Heads Up Display) that is projected onto the inside of a car windshield, similar to that which exists in some advanced fighter jets. It’s also possible the car project is merely a longterm plan to extend the existing CarPlay initiative, which is currently a part of iOS, and allows an iPhone to sync to a CarPlay compatible vehicles and perform a variety of tasks. As is usually the case with Apple rumors, it’s best to take them with a grain of salt until a product is actually launched. Nonetheless, there are enough people working on Apple’s Project Titan that there must be something to it, though it remains to be seen what exactly it will be, let alone how it will look. Topmost image is of the BMW i3 electric vehicle. Can you imagine what the price points of an Apple Car will be? Guessing $55k starting price, up to $90k+ for the best model. It will not be cheap, it will compete with Tesla and luxury cars, it will not compete with consumer cars. They go for the high end, they are not interested in mid-range, and certainly not in the low-end of the market. I am sure it will be beautiful, but it will be expensive, and I’m sure the maintenance costs will be a pretty penny too. Never mind the cost. Your car will simply stop working after the next major firmware update. We will have to buy a new car every 2 years. I just updated to IOS9 because it promised new features. After installing it I discovered that many of the promised features were disabled because my iPad was Gen.4. After apple updates the car firmware we will discover it will no longer be able to drive at night. Or on any new roads. Or make left turns. And after a year or two they’ll change the cable required to charge the car which will require you to buy a $2995 “adapter” just to charge the darn thing. It’ll be slim but you wont be able to read the dash as the font will be too thin and transparent, you not get the battery mileage unless to turn everything off, the radio will only play songs you bought on iTunes, and version 2 will be out before version one leaves the forecourt. And you’ll get offered a software update a year after you buy Apple Car that makes your gas pedal stop working efficiently, so your speed will reduce dramatically and you’ll be limited to 40mph all of a sudden, but with no obvious cause and no alert that would happen, your Apple Car will suddenly just be horribly slow after the software update. But right at the time the software update is released, Apple will also release Apple Car Pro, which costs another $65,000. Oh but don’t worry, like the iPhone Update Program, they will offer payment plans for the Apple Car Pro starting at $1000/month and you’ll get a new Apple Car every year! On the plus side: it won’t crash NEARLY as often as the Microsoft car. You’ll have to jailbreak it to go on dirt roads or in reverse. You’ll have to charge it through a USB C which will also be the port for gas if this is a hybrid. The steering wheel is a wireless touchpad. The window is 1 large retina display. Just tell Siri where you want to go. It’s very light and weighs less than a pound. The tires are permanent. When they wear out you trash the car. Have to buy to order. No possible user upgrades will be available. Next thing you know they’ll try to make an Apple Watch. LOL! Do I buy miles through the App Store? Forced obsolete after 3 years. You’ll have to make an appointment to drive it. It’ll ONLY allow you to go to APPLE APPROVED places. It has a sealed non-user replaceable gas tank, battery, tires…. …and park in disabled spaces a la Jobs. Perhaps license plates are an optional extra for the first month too. Base model has a stool, 20 mile range and top speed of 39 MPH. Mid range model has TWO seats, 30 mile range and top speed of 49 MPH. Top model has 6 seats, 250 mile range and top speed of 130 MPH. Although the price goes up $20,000 each model the only diffs are more seats and larger software limiters. It will be overpriced, made in China, and will require weekly software updates, but the people of the “Apple religion” will buy them. I’m interested to see what changes Apple will make in order to make the car worthwhile. Smart sunroof attached with magnets, matching leather cup holders and haptic feedback letting you know you’ve really closed the door. Drone mount for over the horizon view and to see how cool you look posing with your new fruit flavoured car. I have had that problem before. Try waiting for it to cool and then restart the device.